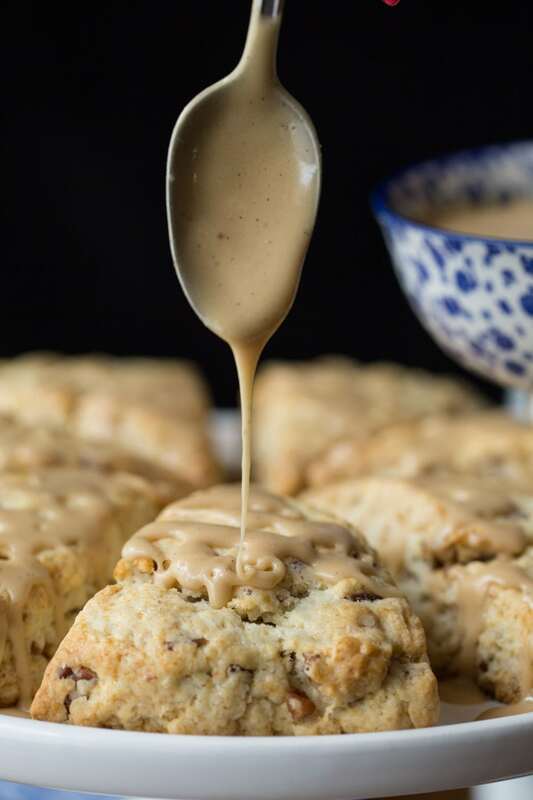 These Ridiculously Easy Maple Pecan Scones are melt in your mouth delicious! You won’t believe the easy technique to make these pecan-studded, maple glazed scones! Remember me? Yep, I’m the crazy cook that seemed to disappear into thin air a few weeks ago. Well not exactly but we have had a pretty wild month, including a trip to London, abruptly shortened by the death of Scott’s mom, a funeral, the hospitalization of his dad (twice) and then cleaning out their apartment and moving his dad to a new home, where he could get more care. I also flew to Memphis for a weekend, where I met my daughter and helped her make some decorating decisions on her new home. (Yes, she’s moving back to the U.S. this summer after 7 years in London!) So I’m not kidding when I say it’s been a whirlwind month here at The Café. But we’re super happy to be back and excited to share a new recipe with you today! Last year around this time I published a recipe for Ridiculously Easy Buttermilk Biscuits that’s gone crazy with readers all over the world. It’s a super easy recipe that I adapted from Cook’s Illustrated. I was fascinated by the simple technique they used to create tall, tender, flaky biscuits in lieu of having to cut or rub butter into flour as is done with traditional biscuits recipes. You simply chill buttermilk till very cold, add melted butter and stir until little “globules” of butter form. The mixture is then combined with flour and baking powder, dropped or cut into rounds and baked in a hot oven. Voila! The easiest, most crazy delicious buttermilk biscuits you’ll ever have the pleasure of meeting! These are the best, easiest, lightest, fluffiest, yummiest biscuits ever. I was in the mood for biscuits and gravy this morning, but I didn’t want to hassle with cutting in the fat. The fact that it uses butter instead of lard and comes out so well is remarkable. I’m keeping this recipe and using it forever. It’s genius! I am always apprehensive about recipes from another continent. Measurements needs to be converted and not all ingredients are available and sometimes things get ‘lost in translation’. I still tried this recipe with great success. It is fantastic and delicious. I used Amazi instead of buttermilk – it is very similar and a good substitute. This was my first time making buttermilk biscuits and they are turned out beautifully. There are lots more comments, you can read them here but I just wanted you to see that I wasn’t spoofing about this recipe! A few months ago I began wondering if this technique would also work with scones. I took one of my favorite scone recipes and gave it a whirl. Again, it worked like a charm and I’ve made lots of scones since, always with rave reviews. The latest variation being these Maple Pecan Scones. Scott and I decided to make a little video to share just how easy and quick the technique is. Check it out! As you can see, the simple maple glaze comes together quickly and pairs perfectly with the crisp pecans and buttery scones. Drizzle as much or as little as you’d like. These scones would be wonderful for an early spring breakfast or brunch. They’d also make a delightful treat to share with friends over coffee or take to a special teacher or neighbor. Or, add a little pizzazz to an ordinary Saturday morning – surprise the family with an extraordinarily special (and easy) breakfast treat. I promise, no one will be able to stay in bed once the aroma begins to waft through the house! 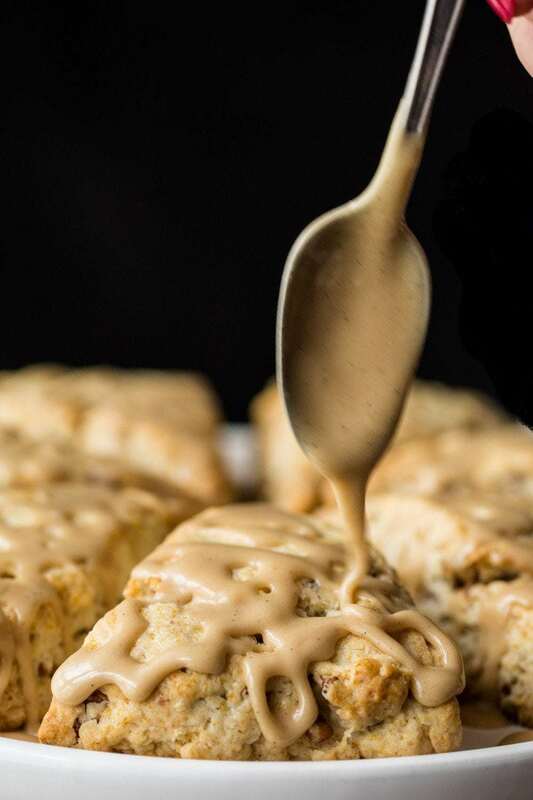 I would be remiss however, not to include a warning with this recipe: once the family/friends taste these incredibly delicious, Ridiculously Easy Maple Pecan Scones, they’ll be requesting them again and again! And again! 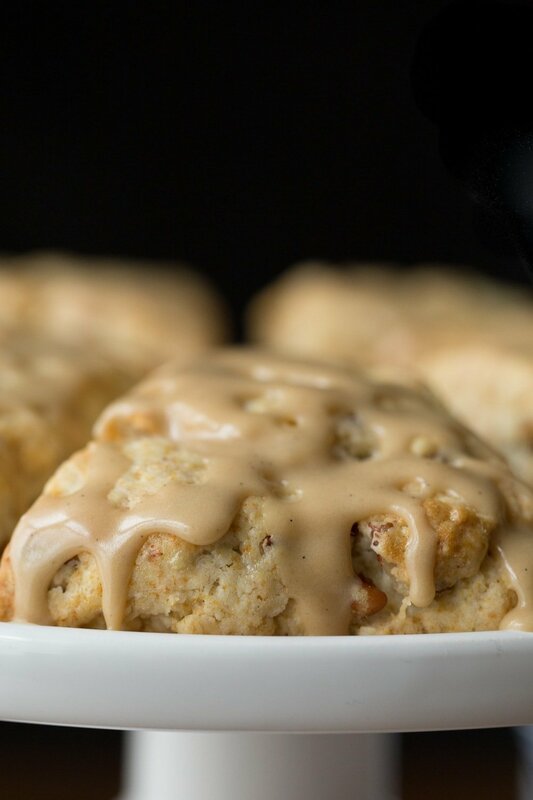 A ridiculously easy technique for incredibly delicious, pecan-studded, melt-in-your-mouth scones finished off with a drizzle of sweet, maple-infused glaze. Place butter in a microwave safe bowl, cover with a paper towel and heat on high for 1 minute. If not completely melted, return to microwave for 10 second intervals till melted. Set aside to cool a bit while prepping other ingredients. Whisk flour, baking powder, sugar, salt and pecans in large bowl. After heavy cream has been chilled in freezer for 10 minutes, combine it with the melted butter. Stir with a fork until butter forms small clumps or globules. Add butter/cream mixture to dry ingredients and stir with rubber spatula until all flour is incorporated and batter pulls away from sides of bowl. Don’t over mix. Generously flour a work surface. Dump dough onto prepared work surface and turn to coat all surfaces with flour. Knead on counter 5-6 times (about 30 seconds) . Flip over on work surface to coat with flour then pat into a 6-inch circle. Cut dough in 8 equal pie-shaped pieces. Transfer wedges onto prepared sheet pan and brush tops with heavy cream. Bake for 15-20 minutes or until golden brown. Let the scones cool before icing. While the scones are baking, make the maple glaze: place maple syrup, half and half, butter and brown sugar in a medium size microwave-safe bowl. Cook on high power for 1 minute, then whisk well to smooth out any lumps. Cook for another minute or until mixture is vigorously bubbling. Remove from microwave and add powdered sugar and vanilla to make a thick, but drizzle-able glaze. If glaze is too thin, add a bit more powdered sugar, if too thick add add a little more cream. 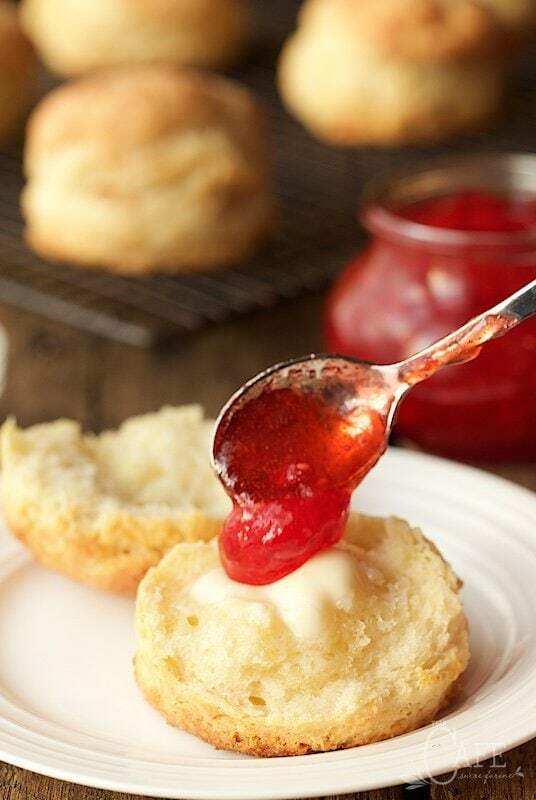 Drizzle glaze over scones. Let scones sit for 15 minutes to let glaze set before serving. I want to make these for Easter but’s want to make them a few days ahead. Could I freeze them? Hi Carol, you could definitely make these ahead and freeze them, unbaked. Then just pop them in the oven that day (frozen) and give them a few extra minutes of baking time. Happy Easter! Made these this morning, very easy . My oven usually runs hot, but I had to cook them longer than stated. I thought they were a tad dry. I”m going to make them again soon becuase they will be gone shortly. They were still delicious. My only addition was grated rind of two oranges, mostly in the batter an some in the maple glaze. I likes the extra flavor it gave to the scones, and the aroma. Great recipe! Amazing!!! I am definitely using this method for all my scones! So glad I found this recipe! Thanks Nina! So happy you tried the recipe and enjoyed it! Hello! I made this for my family, and we loved them! I’d like to make them again for Christmas as a “tea time” sort of snack, so I’d like them to be smaller if possible. Do you have any suggestions for cook times/recipe alterations if I wanted the scones to be half the size of the normal recipe? Thanks a million, they tasted absolutely divine! Hi Grace, so happy you enjoyed these scones. I would check the scones about 5 minutes early and go from there. I would think just a few minutes less baking time would work. This recipe is fantastic! I especially love that I don’t have to mix in cold butter 😁 I added cooked and crumbled maple brown sugar bacon for extra salty sweetness!! Thank you for sharing!! Wow, that sounds wonderful, Linda! Thanks for sharing your results. That’s awesome Elizabeth! I’m so happy you had such great results on your first scone-making attempt! I would probably just sub a tablespoon or two of bourbon for part of the half and half – just depending on how strong you like the bourbon taste to come through. These were fabulous! I never cook my scones that long though, these were done in 10 minutes, flaky and moist inside! I am going to make this base for all of my other scone recipes! Thanks, Debi! I’m so happy you enjoyed them. And yes, this is the only scone recipe I use. I just adapted it with different flavors. I don’t have a microwave. Can I cook the glaze on stove top? Hi Carrie, yes you could definitely cook the glaze on the stovetop! Enjoy! These were incredibly delicious – and very easy to make. The texture was perfection. Thank you! You’re welcome, Amy. So happy you enjoyed them! Our daughter made these for us and they were outstanding! She wasn’t paying attention and accidentally added an extra two tablespoons of butter to the scones. They melted in your mouth. Thanks for the recipe! That’s awesome Ralph! Thanks for taking the time to leave a review 🙂 I’m working on a new scope recipe – with apples and an apple cider glaze. Made them this morning for breakfast, they’re also really good! I just tried to make these and followed the instructions and measurements to the letter. The dough came out more like cake batter than actual dough. I tried to work with it but had to end up tossing everything in the garbage. I re-read the recipe twice and I did everything right. I habe made other scones and the dough formed into a ball…this recipe almost poured out of the mixing bowl. Very disappointing. Hi Leslie, I’m honestly not sure what could have gone wrong with your scones. I’m sorry yours didn’t turn out. I hate wasting good ingredients. I’ve made these scones numerous time and have never encountered a problem. Also, as you can read from the reviews, lots of people have made them also, with great success. Did your butter form the little globules/clumps as described in the recipe? If it didn’t, then perhaps your liquid was not cold enough and that might account for too much liquid in the recipe.